The BC Lions played their biggest game of the year Sunday at Mosaic Field in Regina, and it took the last-minute heroics of Thomas DeMarco and Paul McCallum to come out with a huge 24-22 win over the Saskatchewan Roughriders. Here’s how we saw it through all the nail-biting, From the Couch. Thomas DeMarco certainly had some struggles in the first half. After a strong first drive of the game, DeMarco looked to be a little off on many of his throws. He was facing second-and-long a lot and didn’t have a lot of success. 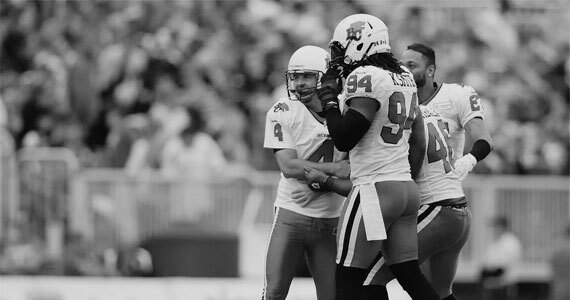 Buck Pierce was inserted for a drive and helped move the Lions into Riders territory for a field goal, giving DeMarco a bit of a chance to calm down and take things in from the sidelines. In the second half DeMarco played much better, converting on two passes for touchdowns and threading the needle on several key completions. Even more important, DeMarco managed the game well and didn’t turn the ball over. On the final drive, he showed tremendous poise. All in all it was a great debut for the quarterback in a tough environment with huge ramifications on the result. In addition to DeMarco the Lions offence as a whole struggled in the first half. Once again the running game was tough sledding and the Lions simply have to find a way to improve in that facet of their game. Andrew Harris did have a huge first down on the final drive of the game on a draw play, but to me he seems to be running a little tentatively at times perhaps as a result of a lack of touches for much of this season. It’s been a long time since Andrew Harris has dominated a football game and it remains a legitimate concern after this big win. In the second half the Lions capitalized on Saskatchewan turnovers and receivers made big catches for a sharper DeMarco. Nick Moore beat his man deep for an easy one and Ernest Jackson made some nice catches in place of Manny Arceneaux. But once again it was Courtney Taylor who was the go-to receiver when the Lions needed those extra yards for the final field goal attempt and once again, he delivered. The Lions defence was the main story of this game, despite all the other side stories. The secondary was outstanding, not only in coverage but on first tackles. Josh Bell had his best game as a BC Lion in my opinion but it didn’t stop there. Dante Marsh, Cord Parks, Korey Banks all had solid games and for the most part held the dangerous Riders receivers in check. The Lions defensive line got good pressure on Darian Durant, who fumbled twice behind centre. Eric Taylor was giving the Rider offensive line all sorts of problems up front and the Riders for the most part abandoned their running game after the first half. Several fans had an issue with the roughing the passer call assessed to Chris Wilson that gave the Riders another chance and led to their last minute touchdown, but unfortunately in today’s CFL any time an arm goes to the head of a QB it’s likely going to draw a flag. He Lions benefited from a questionable call in the second quarter as well. He came close, but the all-time best BC Lions receiver didn’t get his receptions record against his former club and likely won’t with a game sandwiched in between their next meeting. It was clear watching the pre-game stuff that it was a great reunion between the Lions and their former star, and it still didn’t feel right watching him play against the Lions and it likely never will. In a way it would be nice to see him break the record at BC Place, so all of his fans in BC could salute him but I’m sure a few bags of his chips will be making the rounds on the flight home. This game marked the start of three fan road trips that the club as named Operation Orange. Fans get to travel with the team, stay in the team hotel, eat with them and of course represent Lions fans in the stands. It’s a fantastic initiative by the club that they started last year. They will do it again next week in Winnipeg and again for another date in Saskatchewan. I’m sure they are in for a fun flight back to Vancouver in what must have been the road trip of a lifetime for many. The Riders touchdown to end the first half was certainly a puzzling one to many. On the post-game show the official league explanation was that Garrett caught the ball, ran with it and then was knocked into the endzone. Because of the “running motion” he didn’t have to survive contact when he crossed the goal line. I beg to differ with that explanation as I think he was hit as he caught the ball by Adam Bighill. The frustrating thing was the time the league took to review the call, which was seemingly none. Mike Benevides threw the challenge play flag simply to ask for an explanation of why the play wasn’t being looked at more closely…and the beat goes on with CFL officiating. I would love to hear your thoughts on the game. Leave me a comment or follow me on Twitter @BCLionsDen.